It is hard to believe it has already been five years since my bunion surgery. Facebook reminded me today that 5 years to the day, I finally stood up on my two bare feet for the very first time after nearly 2 months post surgery. I remember this feeling like it was yesterday. The soft carpet under my foot was like a little bit of heaven. The sunlight on my skin was so comforting. I recall the biggest struggle during the whole thing was the fact that using crutches limited my ability to do anything else. Both hands held the crutches, so using my hands to do LIFE was nearly impossible. I'd have to lean against the kitchen counter to hold myself up if I wanted to use my hands. The freedom of walking on two feet without crutches was so immense! Even five years later, I catch myself being so thankful for walking. 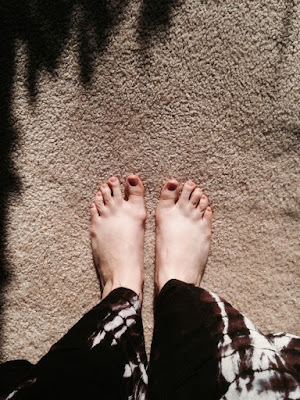 I try to be mindful and notice the sensations as I walk over the soft carpet today in my bare feet, or when I slip on on a new pair of shoes, and when I sink into the soft soil while working around the yard. I find joy in pampering my feet. I refuse to wear high heels. I rub peppermint foot lotion on my feet every night before bed, and I wear bunion regulators so that my left foot doesn't get to the point that my right foot did. Looking back, I don't reflect on the surgery experience with bad thoughts or negative feelings. In fact, it was kinda fun! I loved the adventure of driving back and forth to LA in the rain (Steve may have a different perspective, as I was cozied up in my "bed" he made for me in the back seat). I loved the pampering and everything Steve and others did for me. I literally HAD to just sit there and enjoy hours of television, movies, books, and meals made for me. I loved having a pink cast. I loved wearing my robot boot. I loved driving the motorized shopping cart at the grocery store. It was a crazy cool experience to have to re-train my body to WALK! There was pain yes, but there was also this renewed appreciation for movement, for Steve, for driving, for shoes, for soft carpet, and for carrying things!! YAY feet!